Immersing your children in a foreign language is one of the most long-lasting benefits of going on a career break abroad, something that can have a far-reaching impact on their education and even their future career choices. Getting them to the stage where they are actually fluent, however, can be tricky – but made a lot easier if you follow the right steps. Speaking to your children in a foreign language can feel forced and contrived, no matter how well you may speak it yourself, so it's important to give them access to other ways of language learning. Make use of the resources available and let your children learn at their own pace. Don't forget that while everyone learns languages differently, most children seem to find that soaking it up like a sponge is the best method, far better than rote memorisation or textbook learning. In fact, you'll be surprised at their progress! Start your language learning before you travel. Children of pre-school age will benefit greatly from joining a foreign language playgroup. But while French, Spanish and even Chinese-language playgroups may abound, finding an Amharic or Lithuanian one may be a bit more difficult. If that's the case, hire a babysitter or child-minder who speaks that language, even if they just come round for an hour a week. Older kids will also benefit from hearing the language as much as possible before they go and becoming familiar with the sounds and grammar. If possible, enrol them in lessons once a week and try to get them interested in some rudimentary studying by purchasing fun computer programmes or study tapes, with rewards for success. You might also try to get them a penpal in advance of your trip. Immersion is always the best - and fastest – way to learn a foreign language. If you're keen on language learning more than anything else, enrol them in a state-run local school. Try to get them extra after-school tuition as well, and/or enrol them in an extra-curricular activity they enjoy where they'll be forced to speak. Take advantage of what their schooling offers to make the most of their language learning. If your children attend an English-language school, try to enrol them in a local club, sporting or hobby group. Also, invite non-English-speaking neighbours and friends round to encourage them to speak. Kids, especially teenagers, can be shy of speaking in a new language they hardly know, so helping them feel as comfortable as possible is important. If your children are little, they may quickly forget what they have learned abroad, even if they had become fluent. Hire a babysitter or nanny who speaks the language to keep up their skills, or even a teenager to come round regularly for a play and a chat. It will be worth it in the long run. Adults and older kids may benefit from purchasing foreign language software, CDs, tapes or books. Put a tape on in the car, listen to story tapes before your kids go to bed, make a game out of practicing your language skills. Joining a language club or having spoken lessons at least once weekly is also paramount to keeping your language fresh and up-to-date. Learn a new language in context. Having make-believe scenarios is a lot more fun and also leads to better retention. For most people, pure rote memorisation is a great way to forget words quickly. Make it fun. 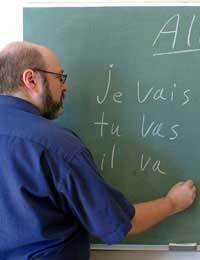 Learning a new language is like a game, but if kids are made to feel embarrassed about their accent or grammar it ceases to be amusing. Practice is often more important than talent. Be encouraging. Everyone learns at their own pace. Sometimes it just sinks in, sometimes it doesn't. If you have more than one child, try not to compare their progress. Buy a good dictionary before you go. Tourist dictionaries are not worth the effort - you'll be disappointed if you try to save money. Be aware that it may be close to impossible to find a good dictionary abroad, depending where you go. Taking the time to fully immerse yourself – and your children – in basic language skills is the best way to acquire the ones you need to adapt easily abroad. Doing two or three things at once – reading a book in a foreign language, having weekly lessons and practicing on-line – will stop you from getting bored and enable fast progress.